I’ve never forgotten that conversation; this man - probably the bravest man I have ever met - admitting that he faced the same fears I do. All my excuses for not witnessing suddenly looked rather puny in comparison. I could tell you lots of things about Jerry Eller. About how hard he works, his seemingly boundless energy, how he hates wasting time; about how much he loves music, how quick he is to pick the hymn at worship, how he enjoys bringing his trumpet to play from his pew at church; his love for camping and hiking, and just being outside; his proficiency with a chainsaw, an ax, or a hoedad; his love for buying things by the case - whether it be avocados, lemons, or Sabbath school lessons; his incredible generosity, and his sacrificial support for foreign missions; his enthusiasm, his willingness to try new things, his quick wit, quicker smile, and the sparkle in his eyes. But the best, most prominent quality about which I could tell you is his love for Jesus. It seems to pervade and motivate everything he does. He would be the first to tell you that he isn’t perfect - that he’s a sinner, saved by the wonderful grace of Jesus - but there are few people who more exemplify the joy of being a servant of Christ. Of a certain, it hasn’t been a cakewalk. Mr. Eller has endured more injustice, borne more sorrows, and gone through more hardship than many could fathom. He has been slandered and stolen from, been buffeted by injuries and insults; has seen everything he had gained from decades of toil stripped away; has lost loved ones; has himself withstood the ravages of long years of illness, besides many more privations of which I am ignorant. For you see, while the devil sought to rob Mr. Eller of everything dear - his reputation, his possessions, his health - he has utterly failed. In addition to being the bravest man I know, Mr. Eller is quite possibly the richest man as well. First, he has an abundant harvest growing in the field, a harvest springing up from the innumerable seeds that have been planted in the hearts of all the people who have had the privilege of meeting Mr. Eller - in a Walmart parking lot, in a checkout line, at a gas station, on the side of the road, on a mountain trail, or in church lobby. Second, he has a mighty, God-fearing family; men and women and children raised with his passion for souls, who will extend his influence far beyond anything he could have dreamed - truly a rich heritage from the Lord. Third, I am quite certain that Mr. Eller has trove of gold - or rather, something more precious than gold: a living, fire-tested faith. And finally, he has the most precious treasure any man could ever possess - the assurance of an inheritance incorruptible, one that fadeth not away, being stored up in Heaven; the crown of life God has promised to them who love Him. Mr. Eller, you have touched my life. You taught me all number of important lessons: how to prune blueberry bushes, how to fell a tree, how to use a push broom properly, how to stay hydrated, how to back a trailer, the proper songs to sing after morning and evening prayer, and how to make the most of every interaction I have with others. Most importantly, you have inspired me to be more like Jesus. And the well- being of your sons will be great. Sabbath afternoon. It was a little over an hour before sunset, and I was itching to spend at least a little bit of time in God’s natural cathedral before the day ended. I drove down to the Eno River behind my new abode, and happened upon a place I’d never seen before - a waterfowl impoundment area. It looked like a promising place to walk, so I parked my car in the empty field off the edge of the road, and headed off. 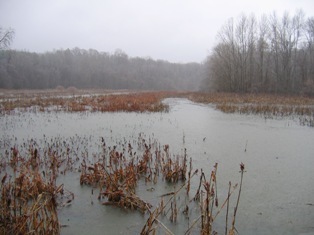 There was a slightly raised grassy berm that stretched to the left and to the right, apparently encircling a large section of forest that was partially flooded to provide habitat for waterbirds to overwinter. I began following the wide pathway on the left, figuring that it probably made a big loop and would bring me back around to the other side of the field where I had parked. I tried once to follow a faint path into the middle forested area, but it quickly turned into water, so I decided to stick with the safe, (but slightly more boring) cleared area on top of the berm. It was a lovely walk. The nearly horizontal sunlight cast everything in a golden glow, and there was a constant chirping and fluttering and squawking from the flooded forest to my right. I examined the discharge pipe that the Corps of Engineers presumably used to drain the wetland, tried my hand at imitating bird calls, scared some deer families, and generally had a lovely walk. Sure enough, the pathway I was following curved around and appeared to be leading me back to where I had started. After about a mile and a half, when I estimated that I was at the top of the circle, directly opposite from my car (12:00 on a clock), the path split, with one fork heading more directly through the center of the circle to the right, and the other continuing on in the direction I’d been heading. Because the sun was getting close to the horizon, and because I’m always game for a more interesting trail option, I decided to take the apparent shortcut. After a few hundred yards, puddles started appearing in the trail. They were easily avoided, so I kept going. A little farther, and the trail became more water than ground. Again, I was up for a challenge, so I kept going. Finally it became obvious that sticking to the trail wasn’t going to work if I wanted to stay dry. I considered turning back and rejoining the outer loop pathway, but I could see that the forest to the left was fairly dry, so I decided to save time by striking through the woods to my left, and hopefully rejoining the outer path (at around 4:00 on a clock). This worked well, and I proceeded until I got to a power line cut going perpendicular to the direction I was going. Because it was headed in basically the direction I needed to go to return to my car, I turned right and started following it. I was enjoying the birds and the sunlight on the cattails, when I noticed that my footsteps were beginning to be accompanied by squelching sounds. I looked around and realized that once more, the ground was beginning to give way to water. I really didn’t want to turn around now, especially because I could see the road I had driven in on crossing the cut about a half mile ahead. I knew my car was relatively close, and it now about sunset. Besides, along the edge of the cut there were some trimmed trees on which I could walk and stay above the encroaching water. So I kept going. A few hundred feet farther, after slipping once or twice, I realized that I wasn’t going to make it back with dry feet. Again I considered my options. In the forest on my right, the water was approaching a foot in depth, and it was only getting deeper. To my left, towards the center of the power line cut, the healthy cattails were evidence of even more water. Straight ahead the water appeared to be slightly shallower. And the road was even closer now. Or I could turn around and retrace my steps. But I’d already come so far. And my feet were already a little wet. And I hate turning around when I’ve been trying an alternate route - it feels like admitting defeat. So I decided to keep going. I would just have to dry my shoes and socks back home. Brr! The water was freezing! I kept slogging along, trying to jump from grass clump to semi-submerged tree trunk without exposing any more of my body to the water than I had to. Finally the trees cleared up on my right, and I looked out over a decent sized expanse of open water! The slightly shallower line that I had been trying to thread my way along ended at the edge of this pond, which also stretched partway into the cut. Again I thought briefly about turning around, but it was too late—I was too committed. By now my main goal was to try to avoid swimming back to my car! I decided to try to wade over toward the cattails in the middle of the cut. Holding my cellphone and wallet up in the air, I struck out across the open water. The chilly muck quickly rose above my calves, over my knees, and headed toward my waist. Finally I made it to the cattails, and just beyond them, to my surprise, was the long-lost berm path! I squished sheepishly along it back to my car, admiring the lovely lake on my right, and pondering the implications of my little adventure. How often do I end up wading through a spiritual swamp because of my stubbornness? How often do I get myself into a difficult situation, and refuse to retreat because of my pride? And how often does Jesus have a dry path waiting, even in the midst of the mire, if I am willing to humble myself and seek His guidance? If the path you’ve chosen seems to be leading you into deeper and deeper into trouble, consider the possibility that you’re on the wrong road, that Jesus has something much better to offer. Don’t let your sunk costs keep you from heeding godly counsel and turning around. You might just end up stuck in a swamp! Historically, cannons have been a huge asset on the battlefield. Because of their power and range, they could do a tremendous amount of damage to the enemy. There were probably few sights more intimidating to an opposing soldier than a long row of bristling iron muzzles pointing at him from across the field. To keep a cannon from becoming a liability to your own forces, however, you have to ensure that it keeps pointing in the right direction. The recoil from propelling heavy projectiles forward at a high rate of speed causes the cannon to lurch backward, and often slightly to one side or the other. If not corrected, this would obviously result in disastrous friendly-fire casualties. To minimize this risk, soldiers would sometimes stake down their cannons to keep them from getting too far off target. Okay, so what does this have to do with Ephesians 4:15? I think our mouths can be analogized to cannons. Properly aimed, my mouth can do a great deal of damage to the enemy. I can speak words of truth that demolish Satan's strongholds and reduce falsehood to rubble. I can also launch projectiles of love that batter down stoney defenses and open the way for the healing invasion of grace. But our mouths also have the potential to cause tremendous harm to our own side. To prevent friendly fire, they must be chained down with the twin restrains of a loving manner and adherence to biblical truth. 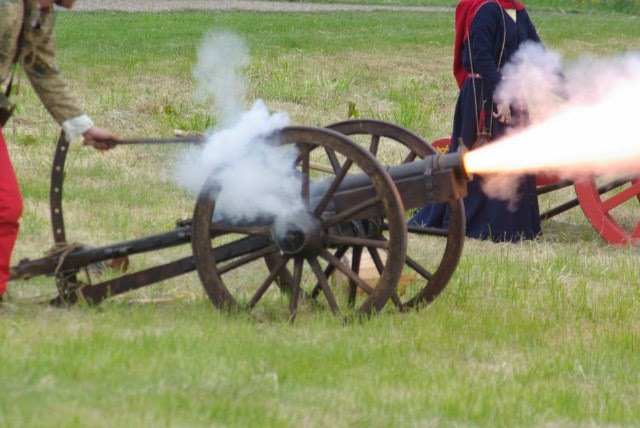 If I launch into battle with a fierce commitment to biblical accuracy, but without the restraint of a loving manner, not only am I not going to be very effective against the enemy, but just like a cannon that is carelessly tied down on only one side, and eventually works its way around until it is launching cannonballs at its own side, sooner or later I am going to start firing broadsides into the ranks of my fellow soldiers. Likewise, if my speech is carefully calculated to avoid offending anyone, but I cast off the restraint of biblical accuracy, I will also inevitably end up hurting my own side. Friends, we're in a real battle; a life and death struggle over who God is, and what He's like. It's a battle for the hearts and minds of men, a battle of ideas and belief - and words are the ammunition. The words we speak will make an impact - on one side or the other! Let's make sure the words that come out of our mouths are both truthful, and loving. 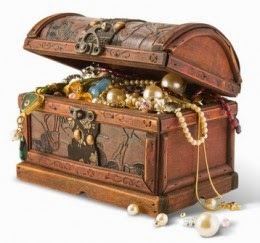 This morning I read from Matthew 13, about the treasure hidden in the field, and about the pearl of great price. I was thinking about the characters in those stories - how each man recognized the import of the choice with which he was confronted, and each acted decisively in choosing the option of highest value. Earlier this week, our Duke Bible study group "storied" the account of the rich young ruler in Mark 10:17–27. I couldn't help drawing parallels between the stories. The young man was also confronted with a choice between holding onto his possessions--his earthly security--and letting go in order to grasp something of far greater value. Unlike the characters in the parables, the young man walked away without attaining the treasure, either because he failed to recognize the significance of the offer, or because he was unable to take the steps necessary to grasp it. Considering these three stories, I began to pray that, if confronted with a similarly momentous choice, God would give me (1) the discernment to recognize its import, and (2) the fortitude to step out actually make the right choice. Then something occurred to me. Wait a minute--what was it that Naaman's servant said to him? "My father, if the prophet had bid thee do some great thing, wouldest thou not have done it? How much rather then, when he saith to thee, 'Wash, and be clean?' " (2 Kings 5:13 KJV). Naaman almost missed a pearl of great price because he thought it was some little thing! Remember the two required qualities to get it right when confronted with one of these choices: the discernment to recognize the significance of the decision, and the fortitude to actually choose the right option, even when it seems contradictory to conventional wisdom? Being faithful in little decisions develops both of these character qualities! Recognizing significant moral decisions requires that we develop a clear channel of communication with the Holy Spirit, and train our spiritual senses to be sensitive to moral choices. And actually making the right choice when it counts is conditioned by our habitual choices in simple, everyday situations. Lord, I want to be the kind of person who has the discernment to recognize the right course of action to take in difficult circumstances, and the courage to take that path. Please help me to see the importance of my simple, everyday choices in developing that kind of character. 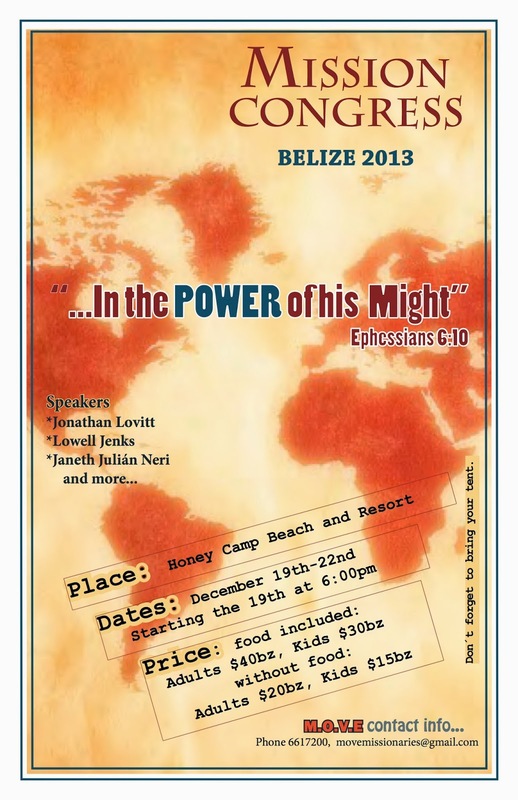 I've already shared these blessings with many of you, but in case you haven't heard about the awesomely kind experiences God arranged for me in connection with my surprise trip to Belize over Christmas Break, this is for you. My hope is that you come away with a deeper sense of the loving character of our God! nd teach me, has kindly connected me with a terrific group of missionaries in Belize. I've been to visit a couple of times in the past year to help out with various projects, and each has been the occasion of much growth, blessing, adventure, and divine appointments. So when I heard that MOVE was going to be hosting a Missions Congress in December, I definitely wanted to participate if God opened the doors. However, when several friends from MOVE contacted me at the beginning of November to ask me if I was coming, I had to admit that it didn't look like I was going to be able to come. First of all, the conference was scheduled for December 19–22, and my exam period didn't end until December 20. Second, the price of roundtrip tickets to Belize is normally around $700, but since it was right around Christmas, the price was even higher. I don't currently have a job, and I didn't feel like I could afford to spend that much money from my savings. I regretfully replied that it didn't look like I would be able to come, but I would keep praying about it. I then proceeded to plan my Christmas Break without a trip to Belize. Towards the end of December, while dreaming about visiting MOVE during Spring Break, I happened to see an ad on Google for cheap tickets to Belize. I never click on those ads. (I am mystified that anybody does, but also thankful that whole world doesn't have my philosophy, because then there wouldn't be any Gmail, or Blogger, or Voice, etc.) Anyway, I saw an ad that listed a flight for Belize for $400. I clicked on it, just for information's sake, with very low expectations, and discovered that it was referring to a flight in December! From Charlotte, NC (about two hours from where I live)! Let me explain. I have looked for tickets from the US to Belize many times over the past year, and I have never seen any for below $650–$700, at least from my general area. Now, less than a month before the busiest time of the year for Belize tourism (I think that's a safe assumption), a ticket opens up for half of what it had been just three weeks earlier, and substantially cheaper than I had ever previously (or since) seen it! Wow! God is amazing! But wait! Just a few days before, the professor administering the exam on Thursday had decided to switch the exam format from a three hour in-class exam to an eight hour take-home exam, available any day of exam period! I immediately (at 10:00 pm) wrote to the professor in charge of my Wednesday exam and asked if there was any way I could take the exam the day before. Long story short, by the next morning, he had worked out a unique arrangement with the Registrar to allow students in his class to take the exam either on Tuesday or Wednesday! The next day, after some serious prayer, counsel with my parents, and not much sleep, I purchased the tickets. That was when the real miracle began. Because I had committed to flying to Belize on Wednesday the 18th, that meant that I had to make do with an exam period 33% shorter that of my classmates. I had just three and a half weeks to finish my classes, write a paper about constitutional interpretation, and study for and take three eight-hour exams (Religious Liberty, Intellectual Property, and Nonprofit Organizations). Needless to say, I lived a pretty concentrated life for that period of time, but God is faithful! Thanks especially to the prayers and encouragement of my family and some dedicated friends, I endured, and at 3:30 am Wednesday, December 19, I was in my car, on my way to catch a plane to Belize!